Pine nuts have in them vitamins and antioxidants, such as Vitamin B, Vitamin E, and lutein — all of which help improve vision. Pine nuts, as the name suggests, are collected from the cones of different pine species and are oil-rich like all other nuts. They are eaten in Europe and Asia since the Paeleolithic period. Roman soldiers ate them and they’ve been mentioned by Greek authors as early as 300 BC. They are small in size, highly nutritious and creamy in colour. 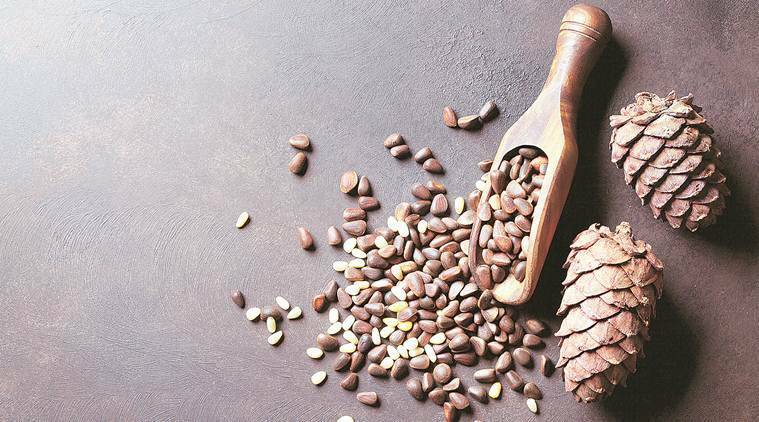 Commonly called Chilgoza in India, pine nuts are now popular in different parts of the world, especially the Mediterraneans, Middle East, Asia, and in Southern America — among native Americans. They are commonly eaten raw or roasted, and their sweet, nutty flavor and crunchy texture lends itself well to snacking, vegetable dishes and is integral part to the famous Italian pesto sauce. In the Middle East, tartar — a creamy paste — is made with toasted pine nuts, bread, garlic, milk and olive oil. High in calories, 100 gm of dry kernel provide about 670 calories. Fat in the nut is chiefly from mono-unsaturated fatty acids (MUFA), a type of fat that helps lower blood cholesterol. According to a study published in The British Journal of Nutrition in 2006, pine nuts are beneficial for controlling blood lipids and coronary heart disease. This is due to their high unsaturated fatty acid- content — primarily oleic acid and some polyunsaturated acids (PUFA). Oleic acid is a mono-saturated fat that helps lower harmful cholesterol and raise good cholesterol. Apart from this, pine nuts consist of a number of vitamins and antioxidants such as Vitamins B, E, and lutein, a form of vitamin A, which help protect cells from free radical damage and also improve vision. They contain important minerals like manganese, zinc and selenium. In fact, manganese levels are so significant (380% of RDA- recommended daily allowance) and can help the body to detoxify the free radical cell damage. These nuts are also a good source of magnesium, an under-recognised mineral. Low levels of magnesium in body can lead to fatigue and numerous health issues like obesity, diabetes, digestive, sleep and mood disorders. Interestingly, pine nuts are natural appetite suppressants. They contain pinolenic acid that enhance other hormones, which act as hunger suppressors and hence they can be a great snacking option. A 2009 study published in the Journal of Diabetes Science and Technology found that pine nuts produced a feeling of fullness, which leads to a reduction in the quantity of food consumed. Pine nuts were found to stimulate the neuronal pathways to the brain that trigger satiation and appetite reduction. However, there is a word of caution. Over-consumption of these nuts can lead to taste disturbances such as dysguesia – commonly known as pine nut mouth or pine nut syndrome. It’s transient, intense bitter, metallic aftertaste can persist in our mouth for a day to up to two weeks. However, there is no serious health risk or side effects other than the taste change as reported by FDA and pine nuts allergy is relatively less documented compared to other nuts.